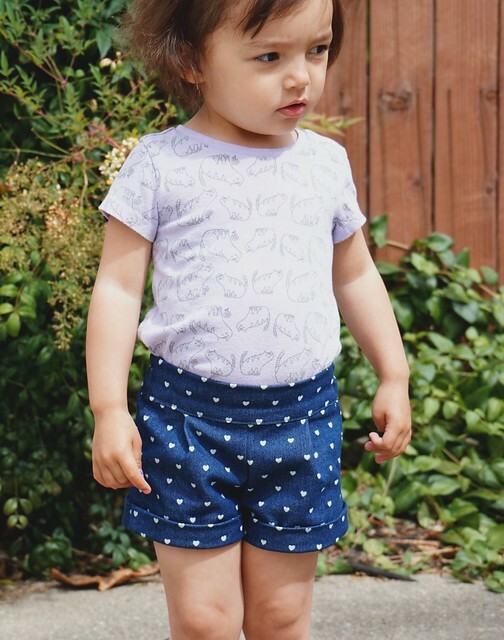 After sewing the Berry Bubble Shorts, I whipped up another pair of Belted shorts for my little one. I used this pattern before when Jilly Atlanta was letting everyone choose a free pattern to try them out and see what they’re like. I made this funky pink pair! I really like the pattern, so when the girls wanted to be matchy-matchy with the heart shorts, I went with this one. 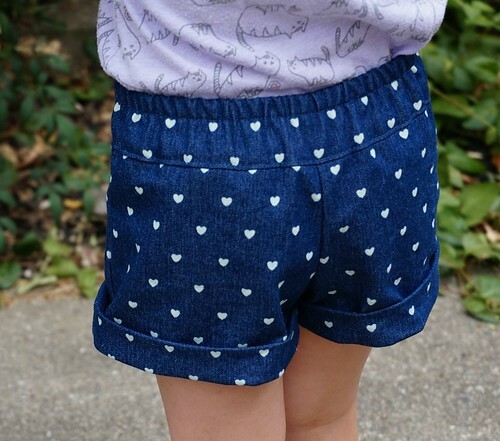 For these denim heart shorts, I omitted the belt loops and belt. I like the flat front and elastic in the back. The pattern is very beginner friendly. There are several pictures and even videos to help out. The only thing I would do differently next time is how the belt loops are sewn. I DESPISE bodkins. That’s putting it mildly. I just cannot get the hang of them. My husband has to do them for me, and I just can’t sit around and wait for him! Anyway, the pattern took me about an hour or less. It’s very quick, and just soooo cute, so she feels special too! I made a size 3, but I ended up shortening the elastic in the back about an 1″ because I’m not using the belt to help keep them up. 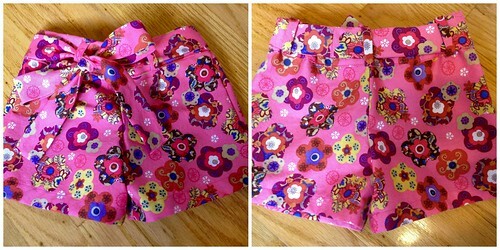 I also made a faux back yoke to match sissy’s Berry Bubble shorts. All I did was sew a line through the elastic casing close to the top. I was actually going to sew another line in the faux yoke space, but I liked the way it turned out this way, so I kept it. Also, I had enough length on these to turn the bottom hem up to make cuffs. First, I just serged the bottom edge to finish it. I turned it up wrong sides together about 1 3/4″ and stitched the edge down. Then I folded the bottom edge up towards the front, pressed very well, and stitched at the sides only. I really love the way these turned out, and they look super adorable on her. Oh my goodness, I should probably get back to my family, it is Father’s Day after all! So cute- so very cute! I love the heart denim! You’re daughter is so precious. I really need some of those shorts now. I know that these are for your little girl, but I’m considering some for a big girl- such as myself. Thanks for the tips and inspiration! Thank you so much! I’m planning on doing the same thing for myself with Blank Slate’s Oceanside Shorts pattern. I have it all cut out in blue gingham, I just need to stop sewing for my girls and do some selfish sewing!! !